Art dealers are still plumbing the depths of the West Coast’s murky art market waters, but California’s Bay Area is home to an increasingly strong collector base driven by powerful local art advisors and buoyed by institutional efforts to cultivate the art scene across commercial and nonprofit sectors. That was more or less the consensus from new and returning dealers alike at the FOG Art + Design and Untitled Art fairs in San Francisco this past weekend (17-20 January), many of which were hoping to reel in some of the area’s enormous capital by casting a museum-focused net with their offerings. The sixth edition of FOG had changed considerably since its more design-focused beginnings, attracting an increasing number of gallery giants from New York and Los Angeles. This year’s first-timers included Hauser & Wirth, Perrotin, Paula Cooper, and Sprueth Magers. At the more curated and accessibly priced Untitled, now in its third year and settled comfortably into a new venue on San Francisco’s Embarcadero, Seattle’s Mariane Ibrahim Gallery, Madrid’s Galeria Espacio Minimo, and local dealer Wendi Norris were among those making first appearances at the fair. The increase in the number of galleries willing to take a gamble on the Bay Area is a testament to the market’s growth and potential for further expansion. According to Amanda Schmitt, Untitled’s director of programming and development, that has less to do with the elusive twenty-something tech-millionaire-turned-collector-donor that dealers and institutions have long sought to attract. Instead, it more so with the various industries that have flourished as a result of Silicon Valley capital, including the real estate, biotech, hospitality, interior design, and winery industries. (Needless to say, the local artist community itself has suffered from rising rents.) Middle-aged tech collectors with wealth accrued from the first dotcom boom are in larger supply, Schmitt says. Across the two venues, dealers tried to find a local angle with their presentations. 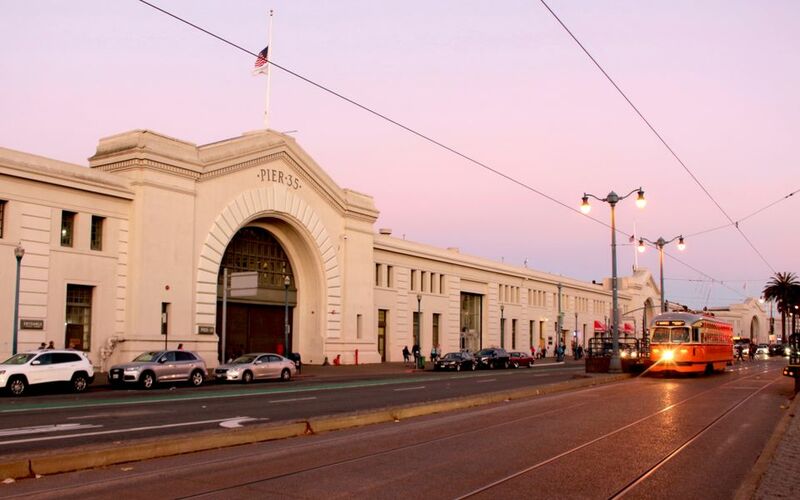 The San Francisco fairs come with the appeal of relative proximity to Asia and a large expatriate Chinese community—a connection that Untitled is trying to nurture in part via a partnership with San Francisco’s Chinese Cultural Center (CCC), which has tapped into its network and that of the Asian Art Museum, one of America’s preeminent collections of Asian art. On the fair’s opening night, one of Hong Chun Zhang’s richly textured drawings of hair in the form of Hokusai waves being sold by CCC had sold to a trustee of the Asian Art Museum. There was a particularly strong showing of photography at Untitled, with dealers trying to leverage the area’s association with the medium. San Francisco is home to the largest institutional space dedicated to photography in the country at San Francisco Museum of Modern Art (SFMOMA), as well as Pier 24, a sprawling photography space housed in a pier on the bay. 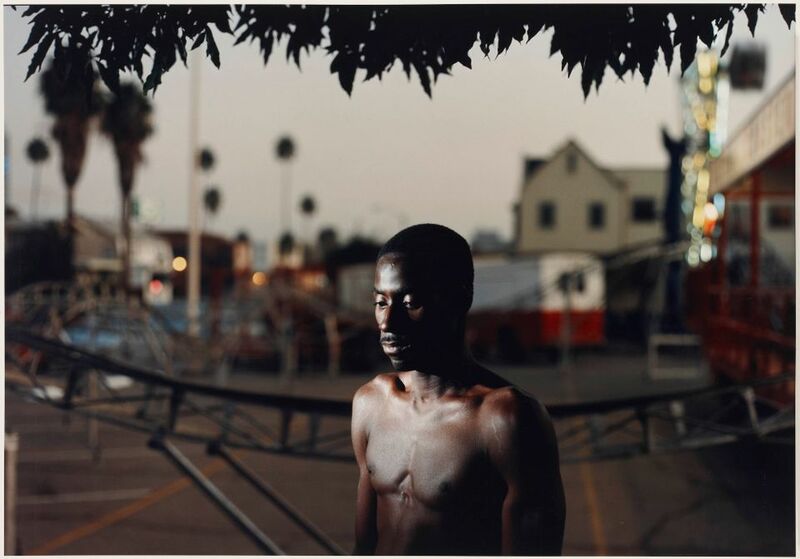 Greg Lulay of David Zwirner gallery, which also had a booth at FOG, says the gallery was thinking of the region’s “rich tradition of photography” with their mini-retrospective of Philip-Lorca diCorcia’s staged photographs. By the end of opening night, the gallery had sold “several” of the works, ranging from $4,000 to $60,000. Mariane Ibrahim showed Ayana V. Jackson’s staged portraits of black women in period dress while Edwynn Houk offered work by established and historical photographers Sally Mann, Herb Ritts, Abelardo Morell, and Brassai, who has a current retrospective on view at SFMOMA. At Marc Strauss’s booth, Timothy Hawkinson also said his booth had a slight leaning toward photography given local institutional interest in the medium, with their presentation of large-scale images by Thomas Bangsted on sale for between $8,000 and $55,000, with several either sold or on reserve by end of opening night. Over at FOG, Spruth Magers had sold two photographs by Fischli & Weiss on opening night to Bay Area collections for €65,000 each. Other galleries at FOG also had nearby institutions in mind, bringing work that related to current exhibitions in the Bay Area, or putting a local spin on their showcases. LA-based gallery Edward Cella showed a series of documentary photographs, drawings, and other works relating to the utopian community in northern California known as Sea Ranch, founded in the 1960s, the architecture and design legacy of which is explored in a current exhibition at SFMOMA. The museum itself, courtesy of their dedicated architecture and design fund, placed a reserve on three works in his booth, including ones by Lebbeus Woods and Buckminster Fuller. Also on view at SFMOMA is a newly acquired work by Venezuelan artist GEGO, which prompted Levy Gorvy to put together a duo presentation of works by she and Carol Rama. At James Cohan gallery, the dealer said he had brought the booth’s two brilliantly wobbly and idiosyncratic pieces by ceramic artist Kathy Butterfly with a San Francisco audience in mind; Butterfly trained under local ceramic legend Robert Arneson. Denny Dimin's booth at Untitled Art. Several galleries at Untitled sought to win collectors over by giving them a deeper look at individual artists. 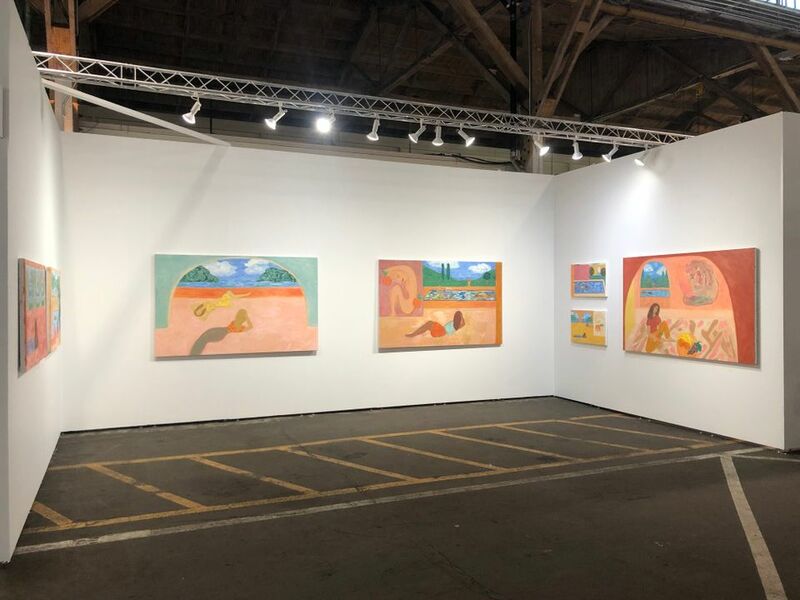 New York’s Denny Dimin gallery returned to Untitled San Francisco for the third time with a solo showcase of works by painter Jessie Edelman whose bright compositions show languorous figures alongside swimming pools and lush vegetation, invoking a fusion of Matisse and Hockney. The gallery’s co-owner Elizabeth Denny says the fair has been “challenging, but in a good way”, and that in the Bay Area they “bring the whole context” of the artist they’re showing. “New York buyers have more at their fingertips,” Denny says, and are more ready to buy when they come to Miami. In San Francisco, however, collectors are looking for the whole story. By the end of opening night, the gallery had sold two of the compositions to San Francisco collectors and one to a remote buyer, retailing at a total of $26,000. Galeria Espacio Minimo traveled from Madrid hoping to find buyers for their West Coast artist Steven Arnold, a relatively overlooked pioneer of queer art who spent time with Dali in Spain in the 1970s. Wendi Norris had a selection of works from Chitra Ganesh’s graphic series based on Bengali author Begum Rokeya Sakhawat Hossain’s feminist, futurist 1905 work of fiction Sultana's Dream that went on view at New York’s The Kitchen last year. She said a museum curator had expressed interest in buying the whole lot, though for $1500 each, they could just as easily go to new buyers.